Tu Eres La Estrella with Honey Bunches of Oats! Calling all estrellas out there! 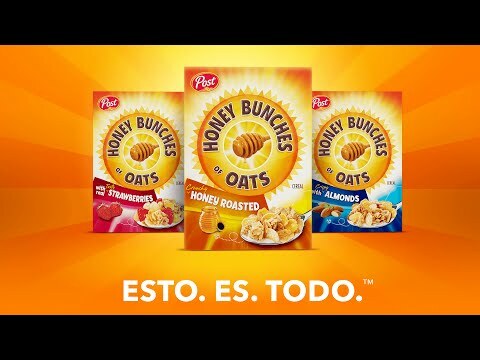 Honey Bunches of Oats invites you to be the star in their latest campaign, #HBOestodo. To show fans they mean EVERYTHING to the brand, they are launching a new microsite to give fans the opportunity to star in their own “THIS. IS. EVERYTHING” video. On top of showing off your flavor, by participating in this contest, you also get the chance to win $10,000 – talk about sweet! Like you, Honey Bunches of Oats wants you to know they aren’t just one thing. There is a multiplicity of tastes and textures found in this cereal – from the crispy flakes to the unmistakable crunchy oat clusters and the sweet touch of honey – for an experience that isn’t just one thing, it’s EVERYTHING. So to bring that all to life, they have created this fun promotion that highlights all of these sabores of our life, in one video of goodness! Ready to share your awesomeness? I already did…and you can check out my video by clicking HERE to get an idea of what the final product will look like. It is super fácil…being part of their bunch is as easy as one-two-three! Preview and customize your work of art. Submit your personalized video for a chance to WIN! So, are you ready for your star turn? Visit HoneyBunchesthisisEverything.com starting now until October 31, 2016 to personalize your #HBOestodo video!